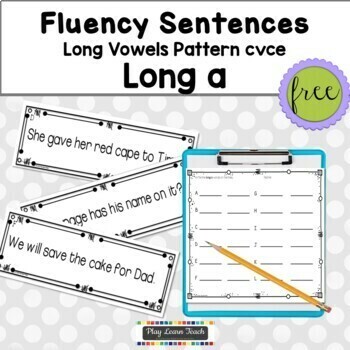 Would you like your students to work on sentence fluency with long vowel words? 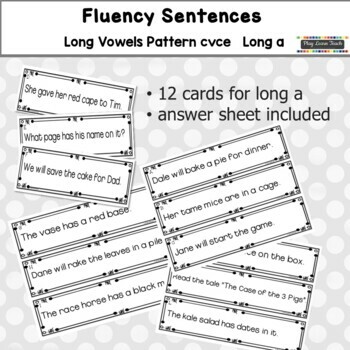 This free sample of Fluency Sentences Long a sentence cards provide an excellent "next step" from single word or phrase cards. Hang these sentence cards in various spots in your classroom. Your students then read the room using one of the three differentiated response sheets. Each card has a sentence with two target words following the cvce pattern. 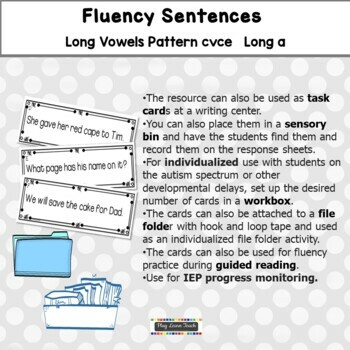 ♦ The resource can also be used as task cards at a writing center. ♦ You can also place them in sensory bin and have the students find them and record on the response sheets. ♦ For individualized use with students on the autism spectrum or other developmental delays, set up the desired number of cards in a work box. ♦ The cards can also be attached to a file folder with hook and loop tape and used as an individualized file folder activity. 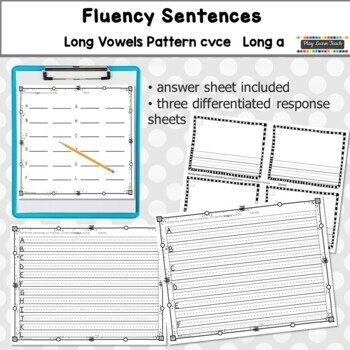 ♦ The cards can also be used for fluency practice during guided reading. As with any resource, preview it before using to see if there are any vocabulary words your particular students might not be familiar with. Click HERE to follow my store. You will receive emails from TPT about my new and updated resources. Please remember to rate products for TpT credits. Credits can be used toward your future purchases on TpT. Go to your My Purchases page (you may need to login). Beside each purchase you'll see a Provide Feedback button. Simply click it and you will be taken to a page where you can give a quick rating and leave a short comment for the product. Your ratings are helpful when creating new products and I can also update any current product based on your feedback. My hope is that you are 100% satisfied and feel you can give the product a 4 star rating. If not, please send me a question/comment if there is something I can do to improve your downloaded purchase. Thanks so much for your purchases, ratings and following my PlayLearnTeach store.